In 1885 vendors from Ohio, Frank and Charles, established a food concession stand at what was to be later named the Erie County Fair. Their speciality was a sliced, grilled sausage patty served on a round bun. Running out of sausage, they sought a local butcher who only had ground beef available. They mixed spices with the meat, including brown sugar and coffee, and made patties to fit the round buns. The coffee after-taste kept patrons returning for more of this new sandwich. A local reporter noting the excitement, asked the brothers what this new sensation was called. Without much hesitation, they named it the hamburger after the town they were in – Hamburg, New York. Although someone prior to that may have squashed a meatball to have it cook faster, no one ever called it a hamburger before. 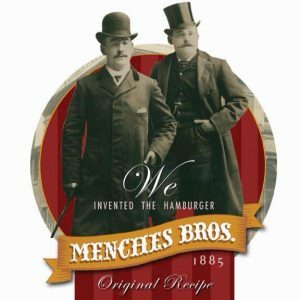 The Menches brothers added the name “Hamburgers” to their awning and introduced the new grilled ground beef on a round bun to fairs throughout the Northeast. Once the newspaper article was discovered 100 years later, the Hamburg Chamber of Commerce held the first Burgerfest in 1985. Ancestors of the Menches brothers, who remain in the food industry three generations later, have travelled to Hamburg to participate in several Burgerfest celebrations over the years. Burgerfest activities include a Taste of Hamburg; highlighting the food of local restaurants, a burger-eating contest, the bed race, a car show, an arts and crafts show, children’s activities and live entertainment throughout the day and night. The Burgerfest is held every year on the third Saturday in July and is located on Main and Buffalo Street in the Village of Hamburg. The event is run by four service clubs including the Sunshine and Evening Rotary, Kiwanis and Southtowns Lions Club.